It’d be easy, having roller-coasted through such an appalling year as 2016, to think that we’re on our way to hell in a handcart and nothing can be done. But having given it careful thought over the Christmas period, I’ve decided what we need – what I need – is a bit of proactivity, so I’m breaking the habit of a near-lifetime and making New Year resolutions. Five in all. During 2017 I will not allow the fact that Nigel Farage looks like an escapee from the pages of Film Fun circa 1955 to lull me into not listening when he speaks. There are two reasons for keeping a sharp ear. One is that it’s important to understand your enemy; if you don’t, you’re a dead duck. The best evidence for that came last June. The second reason for listening to him is that, sad and surprising as it may be, his thinking reflects what’s in the minds of an awful lot of real English people, which is quite different from the thinking we cod ourselves is out there among English people. It’s a bit like back in the 1960s, when I used watch Match of the Day and marvel at the good-humoured chanting of the crowds, even though I could never quite make out the words they were chanting. Then in the mid-1970s I lived in England and went to a couple of games. It soon became clear that what I’d thought good-humoured chanting was in fact an obscene racist chorus that would bring blushes to the cheek of a London taxi-driver. Similarly with the English Brexiteers and Nigel. During 2017 I will not fool myself that the US public are anything like Barack Obama. I don’t mean the colour of his skin, but the quiet, intelligent way that he approaches affairs of state. He’s not perfect – think drones, think Guantanamo Bay, think his comment on Jeremy Corbyn – but he has a rational mind and can articulate rational thoughts. The silent or hidden US people, as identified by those who voted for Trump, are stupid (they really believed he’d build a wall and make Mexico pay for it? ), gullible (He’ll make the USA great again?) and contemptuous of people who are different from themselves (No more Muslims!). I resolve never during 2017 to let the existence of this great mass of sad people slip from my thinking. During 2017 I will remind people at every possible opportunity that the myth of the Honest Ulsterman and the Conniving Southerner is just that – a myth. For a time we got by, telling ourselves that while they might have a brown-paper-parcel attitude to politics down there, up here we at least were blunt and straight with each other. That’s all over now. There are undoubtedly chancers among the political class down south. But up here we’ve had rumblings – Red Sky, NAMA – and now we have the full-frontal Wood Chip Thing. The scale of incompetence and/or corruption among unionist politicians in particular, and their readiness to brazen it out when accused, drove the final nail into the coffin of the mythical Honest Ulsterman..
During 2017 I will not enter a BBC or UTV studio containing UKIP’s David McNarry. Any man who grows apoplectic with rage at the suggestion that the Orange Order could be anti-Catholic is best avoided. So as I say farewell and good riddance to 2016, I’ll say something similar to the sensitive and highly-strung Mr McNarry. It’s been interesting if not particularly pleasant to know you both. During 2017 I will not engage in discussion about who will replace Gerry Adams and/or Martin McGuinness. Like them, loathe them or have mixed feelings about them, history will find an elevated place for both men. Adams in particular attracts repeated attacks by those fearful of Sinn Féin’s increasing strength as a political party. Sometimes it’s bare-knuckle and sometimes it’s presented as a concern that Adams is putting a brake on Sinn Féin progress. The republican party need to make sure they don’t do an SDLP and fail to make provision for the departure of the founding fathers. Gerry Adams is getting on (nothing personal, Gerry – compared to me you’re a whippersnapper) and Martin McGuinness is a man with serious health problems. But I’m not concerned about who succeeds them because I’m convinced Sinn Féin, which has grown to its present point in the teeth of savage opposition, will not risk throwing all that away when Adams and/or McGuinness finally do depart. No one’s saying their successors will have the same stature. But remember Albert Reynolds, when he took over Fianna Fail. Not the most inspiring figure, but his down-to-earth-deal-maker personality was a decided asset for the peace process. Look for something similar when McGuinness or Adams goes. And don’t forget: nationalists and republicans have reason to face 2017 in good spirits. If there’s one thing we can say with certainty about the coming year, it is that the day of unionist dominance is coming to an end, and coming fast. Has unionism any plan to move from not-an-inch and face a very different future? Not that I can see. So may 2017 bring you, on a personal level, health and happiness; and on a political level, the courage to call a spade a spade and a scam a scam. 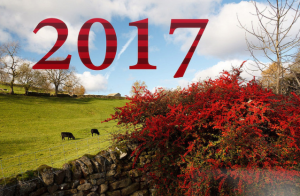 Athbhliain faoi mhaise duit – Happy New Year. The Obama administration were very much part of the globalisation drive, the same one that is driving political union in Europe against the wishes of a growing mass of the people there. They supported Israel for 8 years and only when they are put out of office do they make a stand at the same time they make puerile gestures by kicking out Russian diplomats in a pathetic last ditch attempt to discredit trumps victory. Doesn’t seem to matter that Hilary Clinton was genuinely disliked and untrusted throughout the campaign, that many who said Bernie Sanders was the right choice for this reason or that she did abuse privilege in relation to leaking emails and tried to cover it up, only that Russians were to blame for somehow leaking it to the public through hack attacks. That Denis O’Brien supported Hilary should say it all. So Obama for me will be remembered as a lame duck, who promised everything but delivered nothing, to the extent the US people voted in Trump more out of desperation for change than any of the mad promises he made and who on leaving office chose to risk destabilising the middle east and US relations with Russia out of sheer badness. As for Nigel and Brexiteers. The UK did the right thing and it will be clear that they did in the not so distant future. They have a head start on the other nations who will be following them out the EU exit door and I expect a new economic union and alignment will take place based on what the EU should have been, a proactive trade agreement between nations all over the world and not political union, and which Ireland will eventually join. I never new the myth about the honest Ulsterman, there are honest people everywhere just as there are chancers – but never trust anyone who would lock up a child’s play park on a Sunday. yep,same old story,bit of slegging at a match;;racist..farrage who helped save the place;racist…hopefully 2017 sees further defeats for the lentil munchers of the left,will donald lead the way.i hope so. I agree, gio. But who are you and I against so many? I am glad we have at last reached agreement in 16. What can i say, Jude? Back from shore-leave here.I’m in the process of scribbling some observations on your friend Mr McNarry’s recent maunderings… the year keeps on giving ….Happy New Year! Jude, I wish you and your family a peaceful and happy New Year and thank you for putting a lot of my own beliefs in print, explaining the many ups and downs of politics in the north, for restoring my sanity when the latest attack of Gerry Adams & SF. Living in Dublin it would be very easy to become disillusioned with politics and angry at the insults towards SF voters, however, on many occasions I have read your take on matters and realised that I am not alone. For that and for other commentators on this blog thank you all for sharing your opinions even if I don’t always agree with them. I wish you all a happy New Year and look forward to 2017 with rising optimism. Will next year arise on our Sir Nigel Dodds? A Vet who’ll yet be M.D. of the Cattle Prods. Ar neach nach áil leis tóin a phóg. Happy New Yeat to all. Try to get on a bit in 2017. Try to listen to others points of view with patience and understanding. That’s what I’ll try to do. And kudos to Jude for putting up with all of us. Wow you appreciate the ‘intelligent way’ Obama approaches affairs of state? Seriously. If anything these last few weeks have exposed this US president as a complete clown and fraud. Lacks maturity and teaches us to throw our toys out of the pram when we don’t get our own way. Added to that his cynical use of the Palestinian question simply to poke Trump is utterly pathetic. An absolute coward who in an ‘intelligent way’ pretends he hasn’t funded and sponsored terrorist jihadists in countries that have the cheek(balls) not to do NATO/EU bidding. We need to teach our kids that just because some people say fine words and surround themselves with egomaniacs from the showbiz world doesn’t mean they are genuine, and Obama is the example. Happy, peaceful and healthy new year to all on this forum(even you Gio) and let’s hope the poor Muslim,Christian,Jewish etc people of the Middle East are spared from more NATO/EU inspired terrorism. Here is to some civil discourse in 2017! Who will replace Adams/McGuinness? Most likely Mary Lou McDonald or Pearse Doherty (I prefer Pearse) in the South. Conor Murphy or Gerry Kelly will most likely be Deputy First Minister or maybe even First Minister in the near future. I think Mairtin O’Muilleoir would be a great Deputy First Minister, he was certainly a very popular Lord Mayor of Belfast, though not in East Belfast where he was physically attacked…. We will have to see what Trump does as President. If he doesn’t build the Wall along the Mexican border, if he doesn’t make America “Great again” for the working class, etc then we will only be seeing 4 years of the Trump Presidency even if he runs a 2nd time. If the Democratic Party want to get back into power in the USA they must listen to EVERYONES opinion and concerns. They cant just dismiss the effects of immigration. They cant just label everyone a “racist”. They must learn to listen and take action. And most of all, they must NEVER again field Hillary Clinton as a Presidential candidate. Its important to remember that many of Bernie Sanders supporters refused to back Hillary and instead voted Trump. Hillary really is toxic, that showed when she couldn’t even beat a man who insulted women, the disabled, minorities, etc and who never ran for election before in his life but yet he beat Hillary and is now guaranteed to be the US President. Trump even got over 40% of the female vote and a large minority of the Latino vote despite him promising to crackdown on Latino immigration…..that’s how BAD Hillary Clinton is…. I think the years ahead will show the Unionist grip on politics decreasing more and more. We seen it happening in the past in places like Fermanagh, South Down, Newry and Armagh, Mid Ulster, etc which use to be strong Unionist areas but are now strong Nationalist areas, which require Unionists to create pacts just to stand a chance of success. Belfast is just one or two local elections away from having an SDLP/SF majority, a council which just 25 years ago was extremely anti-Irish, anti-Catholic and anti-Equality. There wasn’t a Catholic Mayor of Belfast until 1997…..think about that…. Will political Unionism accept the inevitable, ditch the sectarian politics and embrace equality? I don’t know. When the DUP’s Willie McCrea lost Mid Ulster Westminster seat to Martin McGuinness in 1997, in his losing speech he threatened the Nationalists of Mid Ulster and promised that they would reap a “Bitter Harvest” because they didn’t vote for him. Indeed after that election attacks on Catholics in the area increased, which many blamed on McCrea’s speech. Unfortunately I think there are far more Willie McCrea’s in political Unionism than Basil McCrea’s, I think the reaction to Unionism losing councils, MLA’s and MP’s in the future will be more of the usual “siege mentality”. Happy New Year Jude and everyone on the blog, have a good one! the women and men who fought for our, national, freedom a century previously, stood outside the GPO on April 24th and the day before was in Coalisland where my family rose the day before. On The US ‘Democrat’s’ they frankly got their NWO right up their behinds, and deservedly so, here we agree, but Obama was as useful as jump lead’s on a bicycle which explains why Trump is Regan, who served two terms and is still popular. On Gerry’s succession, please, not Mary-Lou McMiddleclass, Mary Harney has more political appeal, a gaisun from south Ulster has substantially more. Jessica, spot on, as usual. Athbhliain faoi shéan is faoi mhaise daimh.